Located within the regional park of the Sierra de Gredos, rural house arbillas is the ideal place to rest and disconnect from the daily routine. 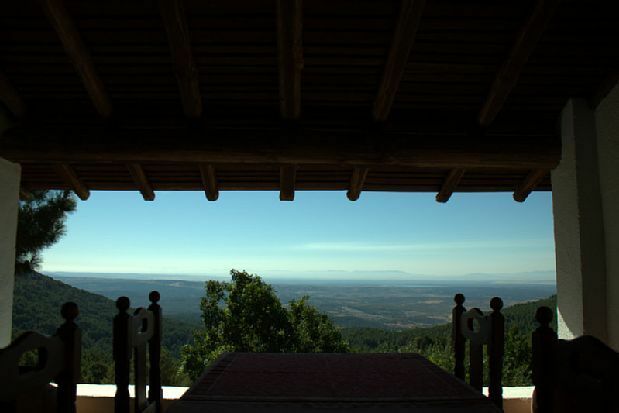 Its incredible views of the entire valley, its beautiful surroundings and the absence of any noise outside the forest make Casa Arbillas the perfect place to really rest. You can make many hiking and mountain routes from your own home without having to travel by car, as well as different activities depending on the time of year you visit such as picking mushrooms in autumn, climbing the snow in winter, see the trees in bloom in spring and go to the virgin and exclusive pools of the arbillas river in summer. Casa rural Arbillas is ideal for families and groups of friends who want to have total peace of mind. The house consists of five double and triple rooms with capacity for twelve people, a living room with large fireplace, terrace and kitchen. The house works with solar energy. In the exteriors we have a large pool, garden and a covered barbecue and equipped with barbecue, wood oven and large table to eat and prepare everything you need, in addition to the rest of the farm where you can walk and observe the tasks involved in the garden the greenhouse and the fruit trees. There is availability to try and buy the different products that are grown at the time of year that the house is visited. The hut, is of construction Celtic type Castro or Palloza de León, consists of kitchen, bathroom, and living room with fireplace, ideal for couples. Located within the regional park of the Sierra de Gredos, rural house arbillas is the ideal place to rest and disconnect from the daily routine. Its incredible views of the entire valley, its beautiful surroundings and the absence of any noise outside the forest make Casa Arbillas the perfect place to really rest. You can make many hiking and mountain routes from your own home without having to travel by car, as well as different activities depending on the time of year you visit such as picking mushrooms in autumn, climbing the snow in winter, see the trees in bloom in spring and go to the virgin and exclusive pools of the arbillas river in summer. Casa rural Arbillas is ideal for families and groups of friends who want to have total peace of mind. The house consists of five double and triple rooms with capacity for twelve people, a living room with large fireplace, terrace and kitchen. In the exteriors we have a large pool, garden and a covered barbecue and equipped with barbecue, wood oven and large table to eat and prepare everything you need, in addition to the rest of the farm where you can walk and observe the tasks involved in the garden the greenhouse and the fruit trees. There is availability to try and buy the different products that are grown at the time of year that the house is visited. The hut, is of construction Celtic type Castro or Palloza de León, consists of kitchen, bathroom, and living room with fireplace, ideal for couples.